As Wikileaks prepares to expose a huge cache of classified diplomatic communications, the US has warned allies that new revelations may lead to public embarrassment. The cables are expected to expose sensitive foreign policy issues including corruption allegations against foreign governments and leaders, and clandestine US support for terrorism. The leak is expected to contain seven times more data than the infamous Iraq War Diaries released earlier this year. On Wednesday, State Department Spokesman Philip Crowley told AFP that the US was “gearing up for the worst-case scenario, that leaked cables will touch on a wide range of issues and countries” Yesterday in an email briefing Cowley admitted the State Department was practicing due diligence and “assessing the possible impact on our on-going diplomatic activity and notifying both Congress and other governments what may occur”. The heart of this issue is the right of governments to keep secrets from their citizens. It has been widely acknowledged that the first two document dumps demonstrated overclassification, while the anodyne nature of many of the “secret” documents demonstrates the over-classification of sensitive material. Secrecy rather than transparency is the norm as the US — like most governments — attempts to keep any documents related to defence and diplomacy under wraps. But surely we are willing to acknowledge that our government has to keep secrets when it comes to foreign policy. An interesting element to this story comes with the confirmation that US has also been briefing NGOs, alerting them to programmes that may be compromised in this new document dump. 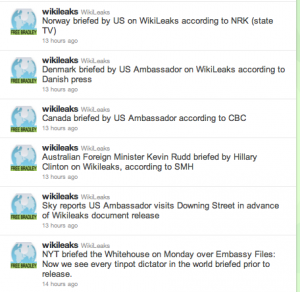 At least these wiki-leaks are draining some of the the poisonous sycophancy that infects the UK ruling elite. For years the “special relationship” has looked more and more like a one sided love affair. At least now the true position of the Americans is out in the open. Which NGOs were briefed? What’s the source for that? Canada CBC (national public funded broadcaster) has removed the ability for the public to add comments on its website. US briefing other governments? So they can all get their stories straight? Maybe we will see how far the corruption has spread. Hail to Wikileaks and its founder. The best news to democracy since its inception.